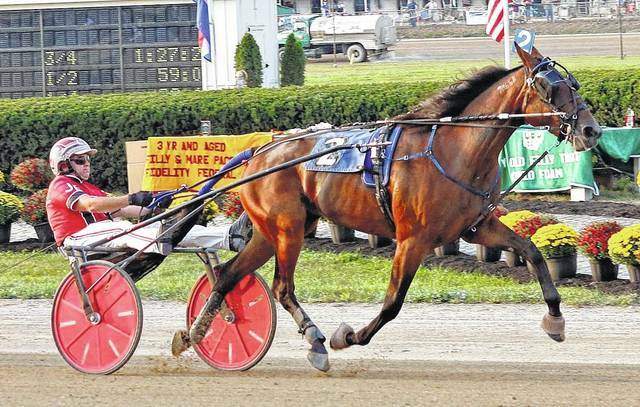 Rose Run Sydney became the newest Ohio ‘Triple Crown” winner when she drew off in the $93,000 (div) Ohio Breeders Championship for three-year-old filly trotters in Monday’s twilight action at the Delaware County Fair. The winner of the Ohio State Fair Stakes and the Ohio Sires Stake Final used a patient drive by Jason Brewer, taking the lead at the three-quarter mile pole and opened up a three length lead at the wire in 1:57 3/5. I Like Purple (Chris Page) and Vatanna (Kayne Kauffman) completed the top three. In the first $46,500 division, Gabbysloosechange returned to her winning ways by cruising to victory in 1:56 2/5. Driver Dan Noble sent the eventual winner right for the lead and led the field of six past the quarters in :28 1/5, :57 3/5 and 1:26 2/5. Away My Baby (Ronnie Wrenn, Jr.) mounted a late challenge but never really threatened Gabbysloosechange. Vandy’s Magic (Chris Page) was third. The sophomore daughter of Triumphant Caviar is owned by trainer Chris Beaver and breeder Johanna Beaver. Gabbysloosechange, who was unraced at two, won for the eighth time in 12 seasonal starts and now sports a bankroll of $185,625. In the $12,000 Signature Series Final, 19 year-old reinsman Joey Putnam guided Sum It Up to victory in 1:57 2/5. Joseph Putnam and Cheryl O’Mara own the six-year-old gelded son of Lump Sum. Today’s action at the Delaware County Fair features the Standardbred for freshman trotting fillies and the Ohio Breeders Championship for two-year-old colt trotters. Post time is 1 p.m.
Rose Run Sydney and Jason Brewer takes the $93,000 (div) Ohio Breeders Championship in 1:57 3/5 during Monday’s action at the Delaware County Fair.